At the end of October Dave Gaboury and I drove to the fairgrounds parking lot in Eagle, CO and gathered our rods and headed down the bank to fish the Eagle River across from where Brush Creek enters. The river was fairly low and Dave and I were hoping to catch a few fish after a very slow morning on Brush Creek. The sky was quite overcast and air temperatures fell into the 40’s while we were fishing. We immediately saw a fisherman across from us in the nice long run and riffle below the entrance of Brush Creek. He was landing a fish as we approached the river, and Dave G. called out and asked him what he was using. The friendly fisherman replied, “prince nymph and jujubaetis”. 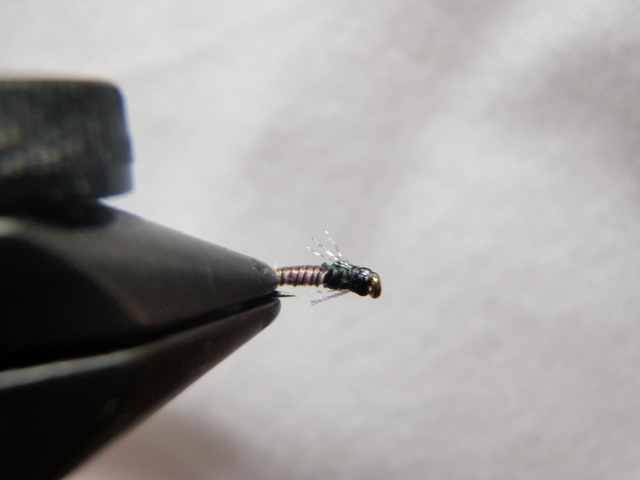 I had seen the jujubaetis pattern in my Charlie’s Fly Box book authored by Charlie Craven, so I resolved to tie this great looking fly. The fact that the gentleman across from us was catching fish on it only reinforced my desire. As I prepared to tie flies for the upcoming season, I made a list of what I planned to tie, and from that list I created a bill of materials. 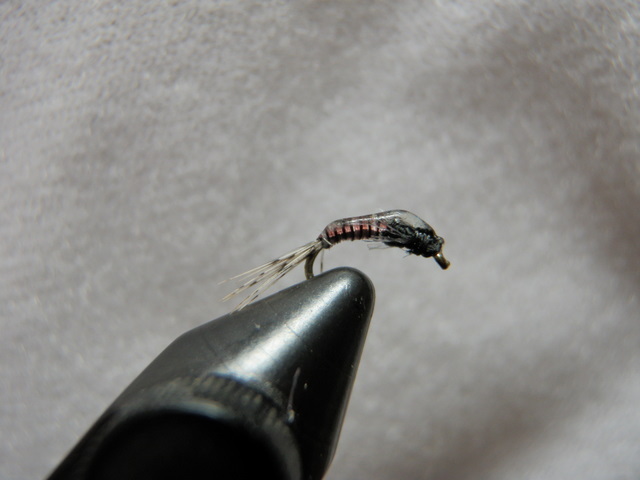 On a Saturday Jane and I drove to Old Arvada and visited Charlie’s Fly Box, and the salesman there helped me obtain the materials necessary to tie jujubaetis nymphs. 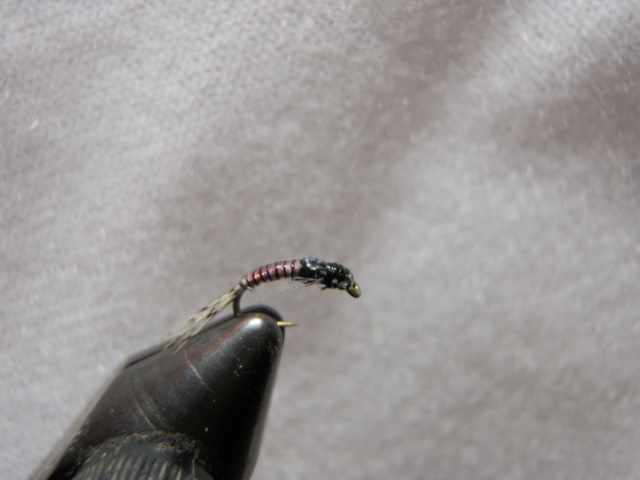 This weekend I pulled out my book and the purchased materials and made five of these great looking flies. 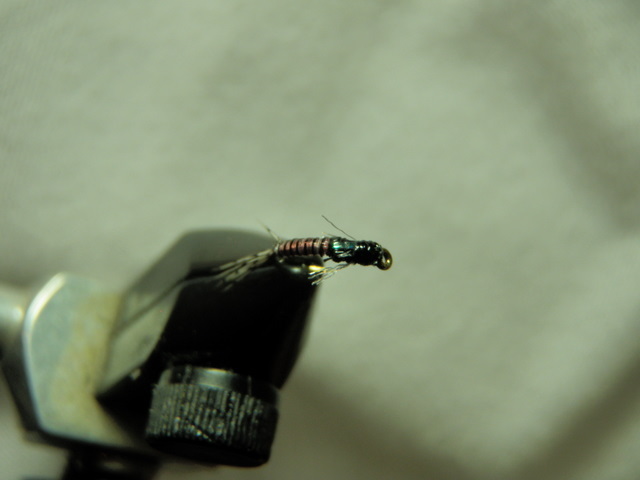 Since tying the jujubaetis involves using two different colors of thread, I made the tail and abdomen on five flies with the white thread and set aside. Next I switched to black thread and tied on the remaining materials. I set these aside and as a last step I added a layer of clear nail polish. I hope to purchase some five minute epoxy and finish them off with the appropriate coating.